For other uses of "Overdrive", see Overdrive (disambiguation). "Keyblade perfection. It boosts all stats, while making it easy to land critical hits and even easier to trigger Reality Shifts." 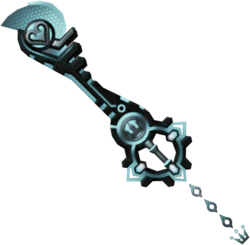 The Unbound is a Keychain for Sora's and Riku's Keyblades that appears in Kingdom Hearts 3D: Dream Drop Distance. The hilt is magenta and resembles the Reality Shift crosshairs, and at the top of the hilt is a crown insignia. The tip of the blade is lime-green with a magenta accent and resembles the Drop gauge, with a design of a heart. Both the hilt and tip constantly emit a gently pulsing light. 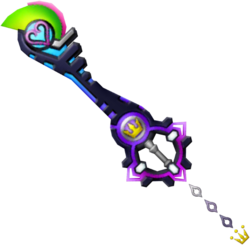 The shaft of the blade is black with magenta and blue accents, possibly a reference to the color motifs used for Sora and Riku in Dream Drop Distance. The keychain token is a crown headed by pearls, identical to the token of the Royal Radiance. The star animation released by the Keyblade was changed in the NA and EU version; instead of showing a purple star with a segment of a circle in the middle, the star looks more like the Keyblade's hilt and has a crown in its center. The Unbound has the highest damage output of any Keyblade in the game, and is also the most successful at landing critical hits and Reality Shifts. However, it is inferior to the Ultima Weapon, End of Pain, and Divewing in terms of magical strength. This page was last edited on 19 April 2019, at 12:55.